Nestled in eastern Oklahoma, the town of Checotah was born of a colorful past, with farming and ranching playing important roles in our heritage. In 1872, when the M.K.T. Railroad built a line south through Indian Territory, it honored a Creek Chief, soldier, and statesman, Samuel Checote, by naming its railhead "Checote Switch." Even though the trains don't stop anymore and the depot is now a museum, farming and ranching are still important to Checotah. Our heritage lives on in Pow-wows, reenactments, festivals and rodeos. "Steerwrestling Capital of the World" is now Checotah's byline, thanks to our many rodeo champions. 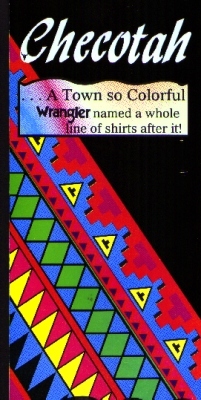 Join us in Checotah ..., "a town so colorful Wrangler named a whole line of shirts after it!" Pre Columbian tribes were the first farmers in the area. They lived near waterways and grew corn, squash, and beans. These tribes eventually disappeared and white explorers entered the area. Ranching eventually entered the economic picture. In the 1830s, the Texas Road, which Highway 69 follows, was an important trail for shipment of cattle and sheep. During the 1830s-40s, the Five Civilized Tribes were relocated from east of the Mississippi to Indian Territory. The area around Checotah became the home of the Creek Nation. It was also during this time the first African-Americans arrived. The influx of these peoples culturally enriched the region. The Civil War disrupted life in Indian Territory, and on July 17, 1863, the Battle of Honey Springs was fought just northeast of Checotah. The battle was a decisive victory for Union forces. In the period of reconstruction and expansion after the war, the town of Checotah was born in 1872 when the M.K.&T. Railroad came through the territory. With the railroad, Checotah became the gateway to fertile Creek grazing lands and a railhead for shipment of agricultural products. Honey Springs Battlefield Memorial Park has gained national prestige as being listed on the National Map of Civil War Sites. On July 17, 1863, smoke billowed and cannons roared when nearly 6,000 Confederates were defeated by 3,400 Federals just 3 1/2 miles northeast of Checotah, Oklahoma. Rodeo has always been a part of Checotah's history. This area is home to many champion cowboys and cowgirls, some of which always return to compete in Old Settler's Day events, including the annual Checotah Round-up Club rodeo. The United Methodist Church is listed on the National Register of Historic Places.